McDonald’s customers are going nuts over the most recent addition to the condiment library: Szechuan sauce. Beloved sci-fi show “Rick and Morty” talked about the sauce that was released as a promotion for the movie Mulan back in 1998. The main character Rick claimed it was the most amazing sauce McDonald’s had ever served. The Szechuan sauce had been discontinued since the movie’s release, but fans of “Rick and Morty“ voted in a McDonald’s Twitter poll to bring the sauce back. With a pretty good amount of feedback, McDonald’s agreed. 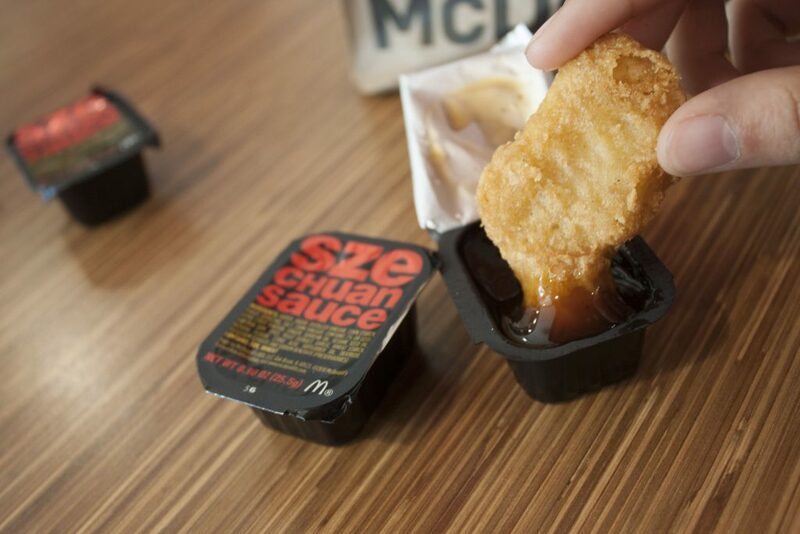 On Oct. 7, 2017, McDonald’s released the Szechuan sauce as a promotion for its new fresh crispy, chicken tenders. However, because only around 100 people voted in a Twitter poll, McDonald’s grossly underestimated the number of people wanting a taste of the sauce. The selected restaurants for the event only got about 20 to 70 Szechuan sauces each. Every restaurant was packed with angry fans all day long. I was extremely excited about the event and went to two McDonald’s that were said to have the sauce. The first one never even got the shipment of sauces, and apparently, the sauce was sent to another store entirely. And the second one gave out all the sauces in the early morning, even though the event didn’t start until the afternoon. McDonald’s wasn’t just giving out the sauce normally. You had to purchase the chicken tenders and you would get a bag containing a random sauce and poster for the event. That means if you did happen to find a place that had the sauce, got there early enough to get in line before they sold out, then have the time to wait four to seven hours in line, you were still at the mercy of luck to even get the Szechuan sauce. Others who got the sauce sold it online. Szechuan sauce was sold for thousands of dollars and some people went as far as selling their cars for one packet. A man who found an original packet from 1998, sold it for $4,000. The fans who don’t have thousands to blow on one packet of sauce were so outraged by McDonald’s lack of stock, they started riots within the restaurants. Some riots got so extreme that staff had to call the police. Later, McDonald’s apologized for the fiasco and promised they would bring back the sauce again, but properly next time. Recently, they shipped 20 million packets of Szechuan sauce to an even bigger selection of restaurants. Finally, on Feb. 26, the fans got their sauce. However, the taste that so many have been left to ponder didn’t really live up to the hype. In my opinion, the sauce is a pretty good teriyaki sauce. The kind you would keep in your drawers at home and use to flavor blast your chicken and rice. It may not have been the sauce that stands against the test of time like “Rick and Morty” led us to believe, but it is a nice addition to the flavors on the McDonald’s menu.